improving the design of taps and other cutting tools, by way of increased stamina and performance, improved durability and reliability as well as efficiency of their work. Consider the basic methods to improve examples of advanced designs of taps. of Particular interest are structural solutions to prevent premature tap failure due to poor chip control, increased cutting forces, fracture toughness and damage blades and other causes. Examples are taps with helical flutes, beskanavochnye, with a short part of the gauge, etc. Spiral flute helix 8-30° from the taps used for threading in detail, made of soft and viscous plastic materials, allow you to adjust the taps of the chip in a certain direction. The chips are promptly removed from the cutting zone and is not pelletized in the grooves than prevented breakage of the teeth of the tap. a Significant increase in the stiffness and strength of the body of the tap is achieved by reducing as the length of the tap and dimensions of flutes of taps. If you use taps with shortened bearing part to 6 or 8 threads the performance of the tapping process is increased by 15%, increases the accuracy of the thread cutting due to the increased rigidity of the body of the tap. If you use the combined tap with double diameter of the thread of the same step, the performance will increase doubled, reduces the consumption of metal for the tool 1.25 times and ensures strict alignment of the thread. for threading in the details of viscous and solid metals, where due to sticking of the processed material on the working surfaces of the teeth of the tap having larger torque, proven so-called beskanavochnye taps with the usual and with an internal chip evacuation. First used when cutting threads in through and the second blind holes. Have beskanavochnye taps cutting blades are formed by short shanks on a fence and gauge parts no longer than the doubled length of the chamfer of the tap. A positive or negative angle of the cutting blade, respectively, provides for a Board of the chip flow by the movement of the tap or the hole to the shank of the tap. In order to avoid increased friction gauge portion of the tap sometimes do with increased back taper (0.2 mm per 100 mm of length). 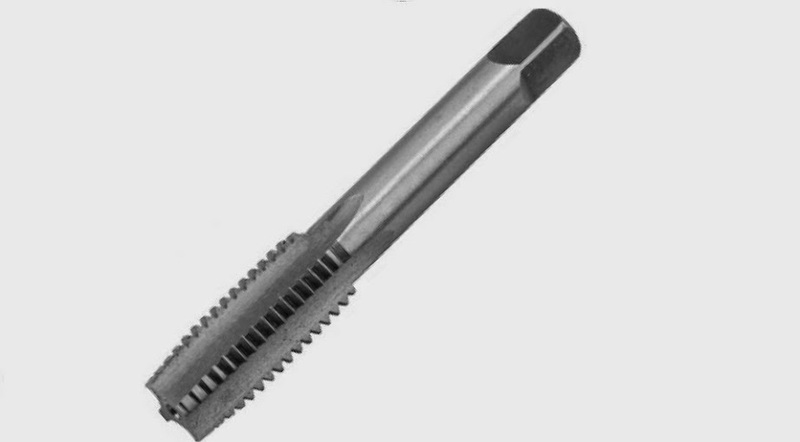 Beskanavochnye taps are widely used for threading smaller sizes (M And 1.2—M 2.6 mm) through the holes and thread is medium in size and in details of silumin. 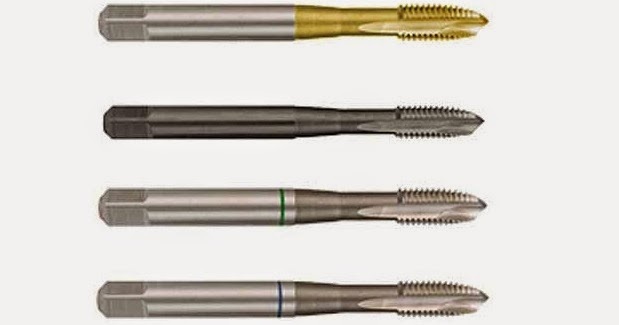 The taps used in the instrumentation for cutting small thread diameters of 0.3 to 1.8 mm, by design, different from the usual and beskanavochnye taps. the Most widespread are trihedral, dihedral and two-grooving taps. The two — and three-edged cutting taps which can be parallel or more symmetrically tilted with respect to the axis of the tap. This form of flute is considerably hardens the teeth-feathers of taps of small dimensions. Rear corners of the cutting of the taps are formed by flat grinding the rear surface of the teeth. The front corners mostly have a negative value, which causes some difficulties at cutting the shavings, but it increases the strength of the teeth of the tap. Shank diameter of taps is usually larger than the outer diameter of the thread and accepted for a specific group sizes of taps are the same. This is done so as to reduce the gripping collets used in the manufacture and operation of taps, and to facilitate their manufacture. When cutting threads in a particularly viscous and tough materials (aluminum, copper, heat resisting steels and titanium alloys), when there are large frictional forces between the turns of the thread cutting and tool , for protection from the interruption of the thread cutting and strong binding of the tap should be used Menci with a discontinuous thread, in which the teeth are cut in a checkerboard pattern. In practice, there are two schemes of taps. The first diagram on the control part, the teeth alternate in a checkerboard pattern, and the second from round to round. Thus for a more uniform load, the feathers of the tap must be odd. Teeth profile in the order specified, as a rule, are removed completely or leave a small scallop height is 0.15 of the height of the thread profile. For cutting tight tight threads and thread accuracy class 1 widely used taps designed by V. V. Matveev, with barrel-shaped teeth at the leading of the . the tap on the cutting and on the first two or three teeth of the control part has the usual unilateral satyavani pen, and the remaining teeth satyavani in both directions from the middle of the pen with a special Cam on the amount of 0,02—0,06 mm. Here due to the increased bearing surfaces of the threads of the tap are reduced axial loads and eliminates the possibility of thread cutting gauge teeth. The surface of the thread cutting to some extent smoothed the barrel teeth leading part. In this Magica provides higher accuracy and low roughness of the cut thread. a Significant improvement in the internal thread (surface roughness up to V5—V6 grades of purity and accuracy class 2) in metals is provided by conventional and helical forming and the plastic deformation. Raskolnik as tap, is composed of working part and shank. The working part includes the intake cone and the gauge portion. The thread on the length of the intake cone — tapered with a full profile, and the gauge is normal. In the cross section of the working part is cut in the form of «triangular» shape. The threads on racketlike steel grades R18 and X12M and solid alloy can be obtain on normal resubstituting machine with special Cams. When using Burnishers significantly increases the productivity of the process and the accuracy and surface finish of the thread cutting. For cutting regular triangular threads in hardened structural (HR045) and heat-resistant steels and alloys, as well as for the treatment of internal krupnorazmernyh special thread widely used corrected taps. To enhance performance when cutting resistant thread taps are used with the profile and stepper corrections. In this case, the feed per tooth of the tap is 0,04-0,05 mm, angular correction profile 3-5°. Alternatively, satyavani taps on the profile. Cutting multiple-start internal thread special profiles is performed with a tap-in wire. Thus, the reduced effect of axial cutting forces on the accuracy of the thread cutting, as axial force is applied from the side of the cutting, and not from the side of the shank of the tap. materials: Gigalo N. I., Kiselev V. V. design and manufacture of cutting tools.